The Florida Department of Highway Safety and Motor Vehicles (FLHSMV) is proud to announce two new specialty plates available now for purchase. 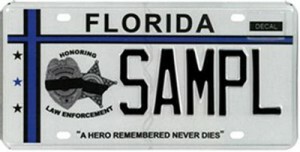 The Fallen Law Enforcement and Florida Sheriff’s Association plates will be available in all tax collector offices by November 6, 2015 to be proudly displayed on Florida registered vehicles. Founded in 1893, the Florida Sheriff’s Association is made up of 67 Sheriffs of Florida to support the needs of the state’s law enforcement community. The purchase of this $25 specialty tag, on top of regular registration fees, will be used to develop and provide advanced and specialized training for criminal justice officers. 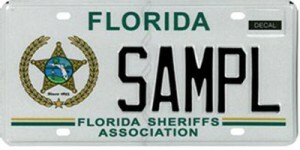 Visit their website to learn more, www.flsheriffs.org. Floridians can now select from 124 specialty plate designs that were created to support collegiate, environmental, wildlife, military, sports, and special interest groups. The designs can be viewed on the FLHSMV website at https://www.flhsmv.gov/html/tagbrochure.pdf.